14 responses to Is there too much flexion in Pilates? Thank you for continuing this conversation…and making it about movement. Indeed. In one article no matter how small or big, one cannot cover all aspects. It is a process. I appreciate your contribution and thank you for including me in your piece. I do hope over focus on forward flexion will change over time. 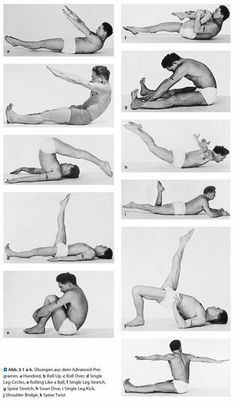 For the classicist, Mr. Pilates had many, many more exercises than is what is commonly seen today. They are accessible. (I’ll teach anyone who wants them.) His aim was full movement of the spine in all ways. It was the earliest programs after Joseph Pilates’ death that focused on a lot of forward flexion…and that is what is still passed down. Let’s move beyond that indeed! Thank you, again, for writing and for letting me be part of your article. Thanks Shari, I appreciate your feedback. Perhaps too often a characteristic is ascribed to ‘Pilates’ rather than to ‘Pilates, as it is often taught’…. I still hope that, if you read part 2, I will be able to make a compelling case for my ‘actually there isn’t lots of flexion’ thesis. And you know what…I really ought to even be more specific…it’s Classical Pilates that is often too much flexion…and that is because of the choice of of exercises that has gone into training programs. And I’m a classicist, so that is why I love to teach the “archival” exercises to teachers so that they can learn the greater vocabulary. And in so many classical Pilates teachers’ styles, there is still a lot of flattened lower backs rather than natural curves in exercises from The Hundred to the Abdominal Series to Footwork on the reformer Leg Springs on the Cadillac to Pumping on the High Chair to The wall…that natural curves get eliminated and become forward flexion. Especially with the additional issue of ‘”closing ribs” and then…it’s all askew! So…that’s when, where and with whom forward flexion is abused. Once we layer on good biomechanics and have a varied vocabulary of exercises…then we’re in balance! OK…I’ll zip it now and look forward to Part 2! Hi, Mike! I will absolutely read Part 2! Thank you for this conversation!! Thank you, as usual, Andrea. (Poster arrived yesterday – very nice). The Neck Pull came to my mind also after reading this: no client ever attempting it for the first time would consider it a “flexion” exercise, it clearly takes a lot of strength! On a relevant side note, many of your posts always make me think about the time period that Pilates developed his method, what was going on at the time in the fitness world, and what developed out of it (some key words are Sandow, Yoga, body building, etc). The whole idea was based on movement, the mind-body connection, and physical strength. And he treated the human body as strong and able, not as fragile and dysfunctional (watching him teach makes this evident). I don’t know where along the way this all got misunderstood and as in everything that aims to succeed in selling fear was employed. I am really hoping the work that you’re doing dissolves some of those fears, because they affect both Pilates practitioners and Pilates instructors, who seriously have a lot on their minds while working to add constant questioning of themselves on top of! Thank you Theodora, very well put. Yes, yes and yes again Mike! I am going to take your advice to never let anyone remove my spine from my body, put it in a vice and apply a uni-directional load to it. To push your point further about adaptive cells bones and soft tissues are dynamic and adaptive structures. Some bones are made of a cortical shell and a core of trabeculae, literally thousands of little interconnecting bony bridges. These trabeculae organise themselves along the lines of force that pass through the bones from our everyday movement. The last time I checked pigs were quadruped animals whose spines will develop to withstand the forces of quadruped life, I’ll wager not quite as much flexion as a biped animal experiences. So not only were those dead pig spines removed from all their supporting structures, they were never developed to withstand that much flexion. Unless of course they managed to source some pigs that had been doing a lot of Pilates. If our bones and soft tissues are adaptive to the stresses that we place through them then if we start to limit certain movements that are bodies can anatomically accomplish then the time may come when everyday life calls on us to make that movement and then we are more likely to injure our tissues as they will not be match fit. Movement is essential the health of the intervertebral disc that throughout most of our adult lives have no direct blood supply and receives their nutrition via the porous vertebral end plates attached to the bones that have a great blood supply. That leads me to my next point. Living tissue in a body, not dissected in a lab is wet, juicy and full of fluid. This alters the mechanical properties of the tissue. Every care is taken in cadaver studies to get the specimen as fresh as possible but it is still not alive, fluids will not behave in the same way as they will in situ. An excellent point was also made about dissection studies on the website http://biotensegrity.com which has some great anatomy stuff to nerd out on. If the studies on dissected spines were conducted at room temperature the tissues involve will have very different mechanical properties to what they would have at body temperature due to the variable visco-elastic qualities of tissues at different temperatures. Again a spine outside of a body is NOT the same as a spine inside a body. I’m not saying that these studies are complete bunk. The results of any study are open to interpretation and there will always be bias. If someone is admonishing your practice as outdated as “This is science” then this is only their interpretation of science. There’s also some fascinating stuff on this site about how our bodies are not the compression structures that we previously used as models to explain force and load. I’m sure we have elements of compressive structures in us, it’s just not the whole story. Thank you for writing this piece Mike. Thanks Jon, do you mind if I paste your reply in another thread? This whole reply will be copied and pasted numerous times methinks! 🙂 Thanks Jon!